(Phys.org)—In the non-intuitive quantum domain, the phenomenon of counterfactuality is defined as the transfer of a quantum state from one site to another without any quantum or classical particle transmitted between them. 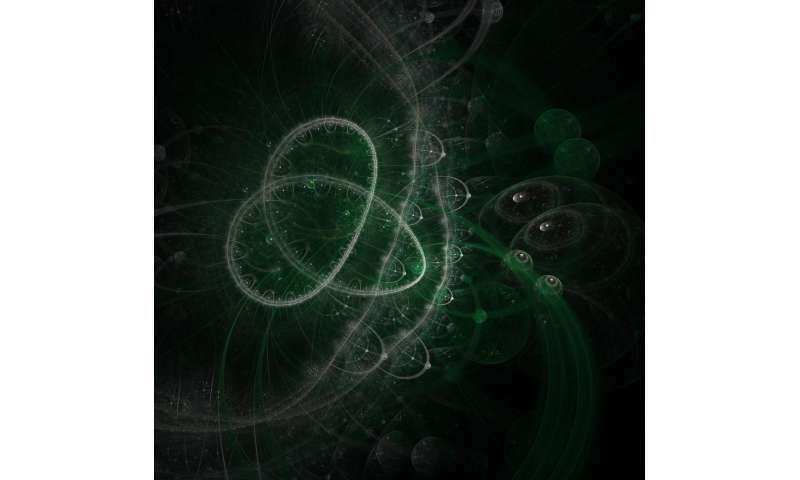 Counterfactuality requires a quantum channel between sites, which means that there exists a tiny probability that a quantum particle will cross the channel—in that event, the run of the system is discarded and a new one begins. It works because of the wave-particle duality that is fundamental to particle physics: Particles can be described by wave function alone. Well understood as a workable scheme by physicists, theoretical aspects of counterfactual communication have appeared in journals, but until recently, there have been no practical demonstrations of the phenomenon. Now, a collaborative of Chinese scientists has designed and experimentally tested a counterfactual communication system that successfully transferred a monochrome bitmap from one location to another using a nested version of the quantum Zeno effect. They have reported their results in the Proceedings of the National Academy of Sciences. The quantum Zeno effect occurs when an unstable quantum system is subjected to a series of weak measurements. Unstable particles can never decay while they are being measured, and the system is effectively frozen with a very high probability. This is one of the implications of the well known but highly non-intuitive principle that looking at something changes it in the quantum realm. Using this effect, the authors of the new study achieved direct communication between sites without carrier particle transmission. In the setup they designed, two single-photon detectors were placed in the output ports of the last of an array of beam splitters. According to the quantum Zeno effect, it's possible to predict which single-photon detector will "click" when photons are allowed to pass. The system's nested interferometers served to measure the state of the system, thereby preventing it from changing. Alice transfers a single photon to the nested interferometer; it is detected by three single photon detectors, D0, D1 and Df. If D0 or D1 click, Alice concludes a logic result of one or zero. If Df clicks, the result is considered inconclusive, and is discarded in post-processing. After the communication of all bits, the researchers were able to reassemble the image—a monochrome bitmap of a Chinese knot. Black pixels were defined as logic 0, while white pixels were defined as logic 1. The idea came from holography technology. The authors write, "In the 1940s, a new imaging technique—holography—was developed to record not only light intensity but also the phase of light. One may then pose the question: Can the phase of light itself be used for imaging? The answer is yes." In the experiment, the phase of light itself became the carrier of information, and the intensity of the light was irrelevant to the experiment. The authors note that besides applications in quantum communication, the technique could be used for such activities as imaging ancient artifacts that would be damaged by directly shining light. Intuition from our everyday lives gives rise to the belief that information exchanged between remote parties is carried by physical particles. Surprisingly, in a recent theoretical study [Salih H, Li ZH, Al-Amri M, Zubairy MS (2013) Phys Rev Lett 110:170502], quantum mechanics was found to allow for communication, even without the actual transmission of physical particles. From the viewpoint of communication, this mystery stems from a (nonintuitive) fundamental concept in quantum mechanics—wave-particle duality. All particles can be described fully by wave functions. To determine whether light appears in a channel, one refers to the amplitude of its wave function. However, in counterfactual communication, information is carried by the phase part of the wave function. Using a single-photon source, we experimentally demonstrate the counterfactual communication and successfully transfer a monochrome bitmap from one location to another by using a nested version of the quantum Zeno effect. Counterfactuality has been demonstrated repeatedly here in the comments on any article related to climate change or evolution. It doesn't sound like they are implying communications faster than c though. THAT would be Nobel prize level stuff. It would also run counter to the rules of QM (i.e. it would require some new physics besides QM). Since they're showing an aspect of QM FTL communication was never in the cards. In order to perform this experiment, they have to receive the photons, and in fact they are retrodicting the counterfactual quantum communication, not detecting it in real time. This is a feature of these kinds of interferometric quantum optics experiments, all the way back to the progenitor of them, the Delayed Choice Quantum Eraser. As a result, as @antialias and @Sonhouse say, there is no implication of FTL. "The wave-function is real but nonphysical: A view from counterfactual quantum cryptography"
Read the paper, it's a fascinating read. Well was it not quantum entanglement that suppose to provide FTL communication? But entangled particles had to be moved, separated carrying undetermined states, so the story goes, in order to transmit information. What they are claiming here is that nothing moves. Excuse me my skepticism but this does not look like QM. What they seems to have done is to generate fast optical noise patterns randomly in large numbers so in the end by a fat chance that got their original pattern, a similar method of solving complex equations with a Monte Carlo methods of intelligent guessing of the right solution. Nothing else I can get out of this post and the abstract. Quantum information transmission differs from this in that it does not allow for the first step (purposefully encoding a message) because that would constitute a measurement (a setting of the entangled property in one of the entangled pair). This breaks entanglement. The only way that classical information could be transmitted by entanglement is if you could *ensure the outcome of a local measurement*. But by the Born Rule you cannot; the particle is in an indeterminate, mixed state, and only the probabilities of various outcomes of the measurement can be determined. This is the Born Rule. Therefore, you cannot use the entanglement as a channel to transmit classical information. As antialias points out, the entanglement can be used to transmit a key; only the sender and recipient can be aware of the key, because it depends on the random outcomes of the measurements of successive particles, and if anyone attempts to measure them in a "man-in-the-middle" attack, they will inevitably alter the key before it gets to the recipient, the key will not work, and the recipient will be unable to decode the later transmissions. The attack can then be detected, because the sender can send a pre-agreed message encrypted with the key, and it will not be decryptable by the recipient. Quantum cryptography solves one problem and one problem only: key distribution. It does not transmit classical information faster than light, and it cannot. One of the clearest signs of a crank is that when their arguments don't hold up, they start making stuff up. @geneticavatar, I'm reading it. So far it looks interesting, but I'm still working on it. I haven't found a mistake yet. @Dungbone, it doesn't matter how many arguments you make up. We all see through them. If you can't stick to the data you are a #physicscrank. @TrollBane, this is another mark of the crank: complaining about being called a crank as an "ad hominem attack" when one denies well-known science. Neither the article in physorg nor the scholarly paper makes any reference to superluminal communication of classical data, but the troll pretends one or the other does, and makes an issue of being called a crank for doing so. Standard crank trolling methodology. And another standard methodology: shifting the burden of proof: the crank always tries to cover up their lack of evidence by claiming lack of evidence to prove a negative, viz., neither the article nor the paper says anything about superluminal communication of classical data, but somehow it's now my job to "prove" it doesn't. It doesn't. That's the end of the proof. If the crank claims it does, it is invited to present some evidence. The ideas of darwinian evolution and abiogenesis are counter factual to real life observances. Organisms only reproduce after their own kinds [ a designated family with lots of variation but absolutely no crossing of boundaries] and non-living things never assemble spontaneously into the complex biological form of a fully functioning, living cell as we know it, all by itself. These are what we observe daily and confirms what has been known to happen since time began. There has been no observations to counter these facts. Anyone believing that darwinian evolution or abiogenesis is true needs to supply substantiating evidence that can be verified by peer examination. The current paradigm of assuming that it's a fact and then digging up dead fossils and attaching a story that supposedly validates the assumption is just sheer lunacy. >Particles can be described by wave function alone. Not really. When you write "described" in the context of physics it means "completely described," e.g., the position and momentum are known. The wave function doesn't know either. Otherwise we could "describe" anything by stating that it is located in the universe and has finite energy. Organisms only reproduce after their own kinds [a designated family with ...(Fred's blah, blah, blah...) functioning, living cell as we know it, all by itself. These are what we observe daily ...(MORE of Fred's blah, blah, blah...) The current paradigm of assuming that it's a fact and then digging up dead fossils and attaching a story that supposedly validates the assumption is just sheer lunacy. Facts (observations) build the "story", not assumptions. Your constant denial of rational process is considered "sheer lunacy" by most everyone else. a book of faerie tales that has been proven false?